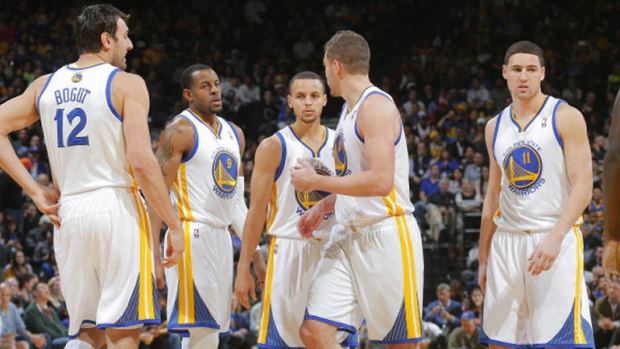 The Golden State Warriors entered their five-day break between games a little banged up. 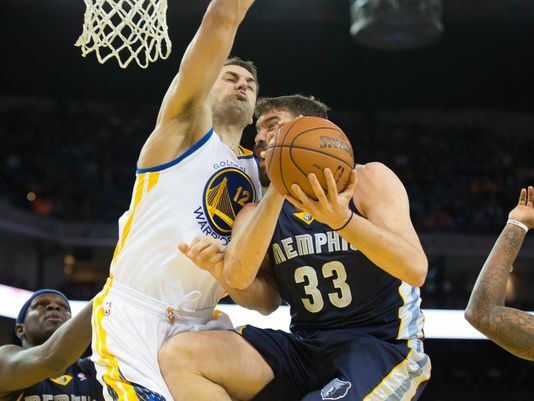 After Friday night’s victory over the Memphis Grizzlies, in which Marc Gasol knee’d Andrew Bogut in the groin, they’re even more banged up. David Lee suffered a hamstring strain in last Saturday’s game against the San Antonio Spurs, Stephen Curry has been nursing a right quad injury, although he told LetsGoWarriors.com last Tuesday that it was all but gone, Andre Iguodala has been dealing with a right “jumper’s knee” or knee tendinitis, prior to the pelvic contusion Bogut had a tweaked ankle, and Festus Ezeli is still rehabbing from right knee surgery. This time off helped heal some of the wounds that many Warriors’ players were dealing with, and it also allowed us to get an update on each nagging injury. Mark Jackson said David Lee (hamstring) hasn’t done any live running yet, & he’ll be smart despite the power forward’s desire to play vs NY. At Tuesday’s practice, Lee discussed his injury status and the benefits of this break. “Everybody got to get away from the game for a couple days and get rested up,” Lee said. “As you know, I’m battling a little hamstring thing, so hopefully I’ll be ready for Friday, making progress everyday. But without that, I’d be having to miss games right now. At Wednesday’s practice, Curry discussed his quad injury with us. “It’s pretty much gone at this point,” Curry said. 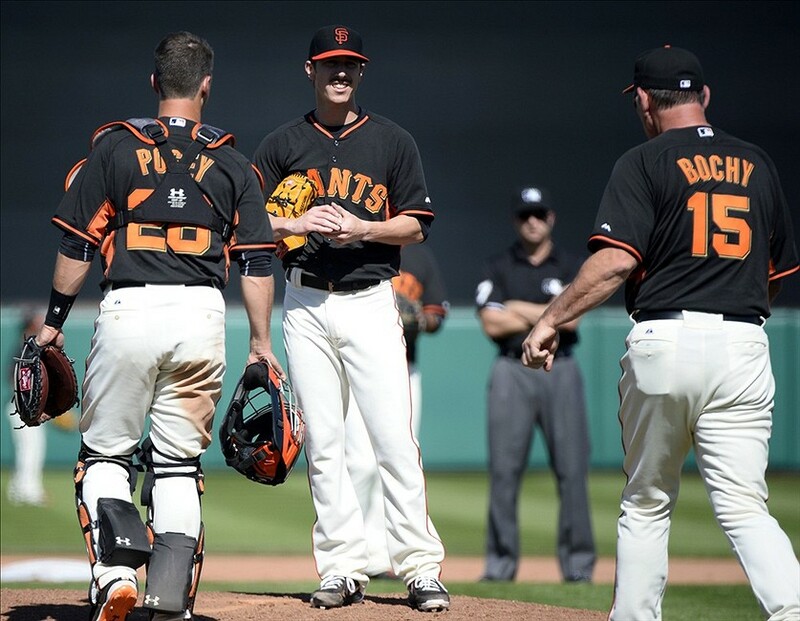 “The rest from this week helped to get that last little bit of soreness. I still got to do a little bit here and there to get ready for games, but at this point in the season everyone’s got nicks and bruises and bangs. Iguodala discussed the five days off and provided an update on his knee tendinitis at Tuesday’s practice. Read updates on Andrew Bogut and Festus Ezeli’s injuries and the rest of the article at Let’s Go Warriors. When news broke out about the reassignment of former assistant coach Brian Scalabrine, the rumors about Mark Jackson’s future with the Golden State Warriors started swirling. This has been a hot topic for much of the Warriors’ season, and whether it’s warranted or not, this piece of news added fuel to the fire for people who want Coach Jackson fired. Curry has consistently expressed unwavering support for Jackson, and has shown no indication of backing off in the face of mounting criticism of the coach. “We’re two years removed from being a terrible basketball team,” Curry said. “The transformation we’ve had since coach Jackson has been here is obviously evident and it raises the expectations. Yeah, we’ve lost some winnable games and games we shouldn’t have along the way, but that’s part of the growth process. We’re on pace for the best season in 20 years. That’s a sign of good change. “I support coach 100 percent and understand what he’s done for us. Being in the locker room every single day and just observing from my rookie to year to now what has changed. Most of all of that is a result of him. If CEO Joe Lacob is considering whether to retain Jackson or perhaps offer him an extension – or consider dismissing him – Stephen Curry would like to be involved in the process. “I love coach and everything he’s about. I love playing for him and that’s all that matters to me. Curry has been the voice of the players, but other people, outside of the organization, have shown appreciation for Jackson’s coaching as well. Klay Thompson’s father, Mychal Thompson, a 13-year NBA veteran, admires Jackson’s coaching and appreciates his praise for Klay’s game. Told of the high praise, Thompson said he loved hearing it from Jackson. It’s Jackson whom Mychal Thompson credits for instilling the confidence in his son. Jackson has a very close relationship with his players, and Ethan Sherwood Strauss of ESPN believes that’s partially due to his preaching about faith and religion but also his faith in his players. But Jackson believes in belief and believes in his guys. Harrison Barnes, Draymond Green, and Festus Ezeli all saw substantial roles as rookies. Green shot miserably throughout last season. Jackson reiterated his faith in Green’s game, kept feeding him minutes, and Green came through big for Jackson in the playoffs. The second-rounder has emerged as a valuable defensive player in his second year. Jackson promotes confidence, bragging outright about his players and their capabilities (he has compared Green’s defense to that of LeBron James, for example). His strategy is to raise internal expectations through effusive praise, in hopes that the power of positive thinking shifts the paradigm of a historically awful franchise. There’s anecdotal evidence that Jackson’s religiosity helps the Warriors. The quite religious Jermaine O’Neal signed a reasonable contract with Golden State. Noted Christian Andre Iguodala built a relationship with Jackson before heading west from Denver. In Iguodala’s introductory news conference, he mentioned getting to know Curry (and Kevin Durant) over chapel sessions at the 2010 world championships. By all indications, the great majority of Warriors players like how faith intermingles with work. 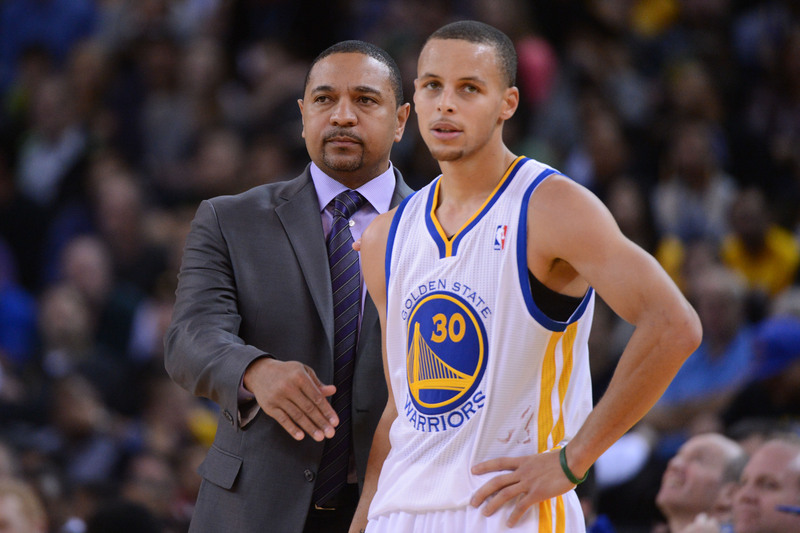 It appears as if the team, especially Curry, want Coach Jackson to remain as their head coach. Will management listen to their star player and stick with Jackson? Multiple players have told me they get the sense Jackson could end up leaving – whether it is by Jackson’s choice or management’s. 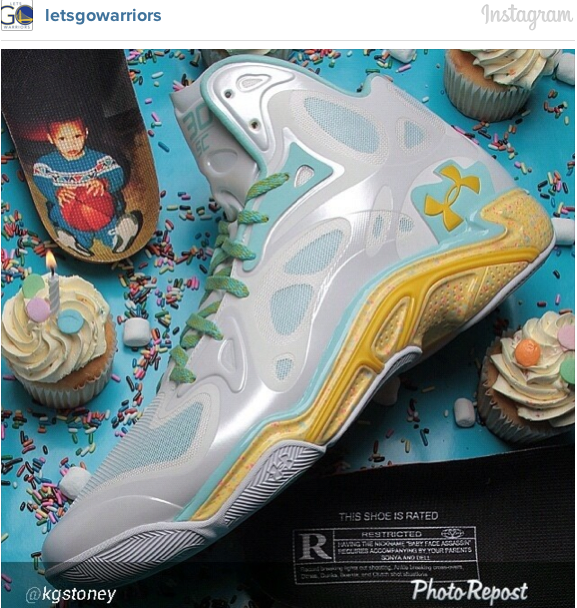 Stephen Curry is a superstar on and off the court. He has the confidence but also the humility of a true star. On Monday, Curry displayed this confidence on the Dan Patrick Show when he discussed his chances in the #DubBracket Challenge, the three-point shooting bracket challenge that Golden State Warriors’ players and coaches — although only head coach Mark Jackson remains alive after one round — are participating in, his defense, and more. 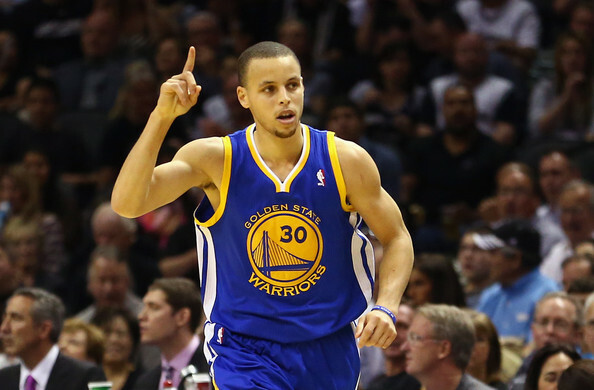 Curry came out and declared that he will win the Warriors’ #DubBracket Challenge. Patrick questioned this statement, because he pointed out how Mark Jackson was able to beat him in a three-point shootout earlier in the season. Curry explained that he lost to Jackson because he was icing his shoulders right before they started shooting. Curry also displayed confidence when discussing his defense, which has been highly criticized over the course of his career. 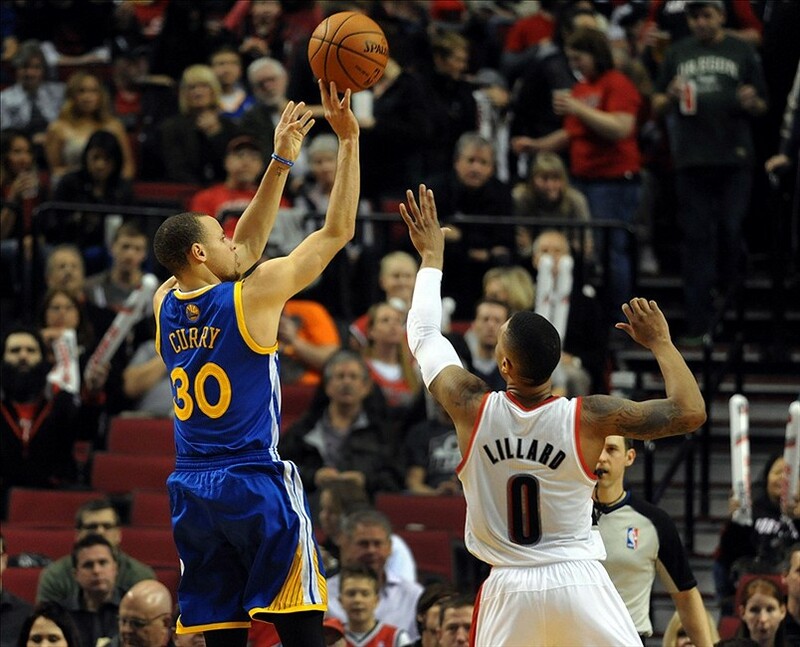 Curry credits his defense to his quick hands and his peskiness. He also claims that he tries to make his opponent uncomfortable on defense. These are all reasons why Curry believes that he could shut down Coach Jackson if he were to guard him. “Shooting threes, he got the best of me one day, but I don’t think he can score on me,” Curry said about Coach Jackson. 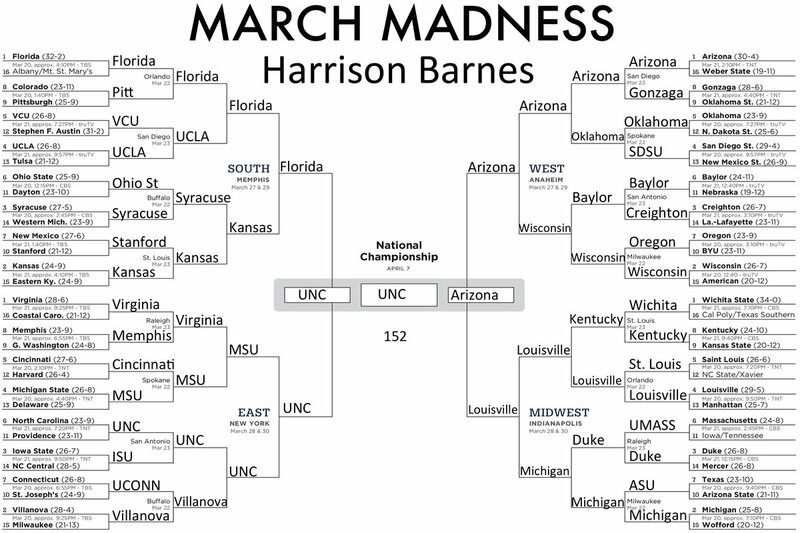 Read more about Curry’s thoughts on the NCAA Tournament, Jabari Parker, Andrew Wiggins, and the Warriors’ plans for playoff goatees at Let’s Go Warriors. 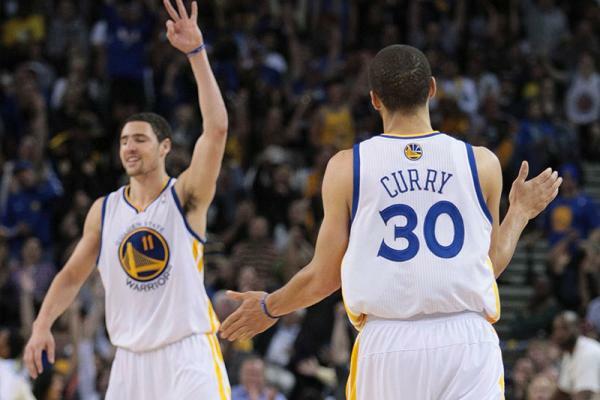 Golden State Warriors: Evaluating Remaining Schedule–What Seed Is Realistic? 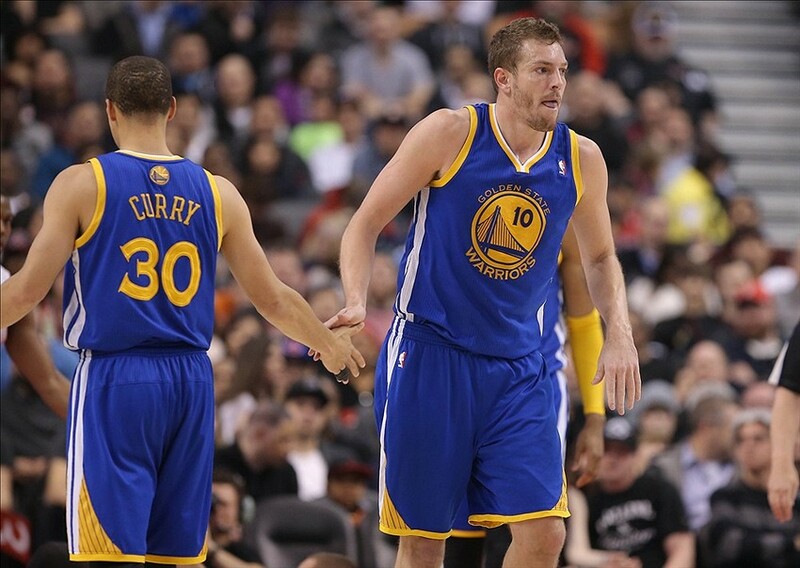 The Golden State Warriors are in a tight playoff race in the Western Conference. The good news is that they have a fairly manageable schedule in the last stretch of the regular season. With 13 games left in the season, the Warriors have eight of those games at home and only five of them are against playoff-contending teams. Th Warriors do have three more back-to-backs in the regular season though, which isn’t exactly ideal, especially since two of them are near the end of the season. Their first back-to-back is on the road first against the Dallas Mavericks on April 1st and then against the San Antonio Spurs on April 2nd. Then, they have two back-to-backs within the span of four games. On April 10th, they play the Denver Nuggets at home, and they play the Los Angeles Lakers in L.A on April 11th. Then, on April 13th, they play the Portland Trailblazers in Portland, and then they play the Minnesota Timberwolves on April 14th at home. In their remaining schedule, the Warriors face a lot of opponents with inferior records during the rest of the season, and those games should all be won. There are a few games that they need to view as must-wins, because of playoff seeding. These three games are on March 28th at home against the Memphis Grizzlies, that April 1st game in Dallas, and that April 13th game in Portland. Also, the Warriors have almost a full week off between their game against the San Antonio Spurs on Saturday and when they play the Memphis Grizzlies next Friday. The Warriors need to ensure they don’t lose their rhythm during that time off. As mentioned before, the playoff race in the Western Conference is extremely competitive and even tighter than usual this season. Portland, Golden State, Memphis, Dallas, and the Phoenix Suns currently occupy the fifth, sixth, seventh, eighth, and ninth seeds in the Western Conference. All five of these teams are within five and a half games of each other in the standings. The Warriors are currently that sixth seed and only 1.5 games behind Portland. The Warriors should aim for that fifth seed, and it’s quite possible that they could snag it. The Warriors’ huge win over the Blazers this past Sunday was huge in terms of standings, and their game against the Blazers on April 13th will also be significant in terms of standings, especially since it’s at the end of the season. Beating the Blazers will obviously improve their chances of snagging that fifth seed from them, but here are some other things they can do to improve their chances of moving up in the standings. First of all, the Warriors need to play better at home. They currently have a 21-11 record at home, which isn’t bad but could certainly be better given Oracle Arena’s energetic and passionate crowd. They’ve let some winnable games slip away at home this season, including games against the Washington Wizards, Charlotte Bobcats, and the Cleveland Cavaliers. Speaking of these winnable games, the Warriors also have to improve on playing with the same amount of energy and effort every night. They sometimes play down to their competition. Given the tightness of the playoff race in the Western Conference, the Warriors can’t afford to lose any more of these games for the rest of the season. The Warriors also have to limit their turnovers, especially the careless, avoidable ones. Turnovers disrupt with their offensive rhythm and gives their opponents easy transition buckets. The Warriors are so dependent on playing games at their speed and their tempo, and when their opponent disrupts that, the Warriors can easily fall off course. Lastly, the Warriors need to keep playing their stellar defense. The Warriors are focused on making defense the priority for the rest of the season. According to Rusty Simmons of the San Francisco Chronicle, the Warriors came together after their loss against the Cavs last Friday and discussed the importance of defense. If the Warriors can stay healthy, they have an excellent chance of snagging that fifth seed. Given the amount of talent on this team and their recent streak of near perfect basketball (minus a game or two), the Warriors are starting to peak at just the right time. The Warriors can take some of this momentum into the playoffs, most likely as the fifth seed.